Evelyn Todd (Laura La Plante) has been fired from her job as a dancer in the chorus line. Desperate for money, she takes a friend’s advice and attends a party where she can make money just for showing up and flirting with a few older, rich men. At this party she meets and spends some time with a sleazy womanizer named Guy (Robert Ellis). When she returns home from the party, Evelyn sees that she’s been evicted from her apartment. 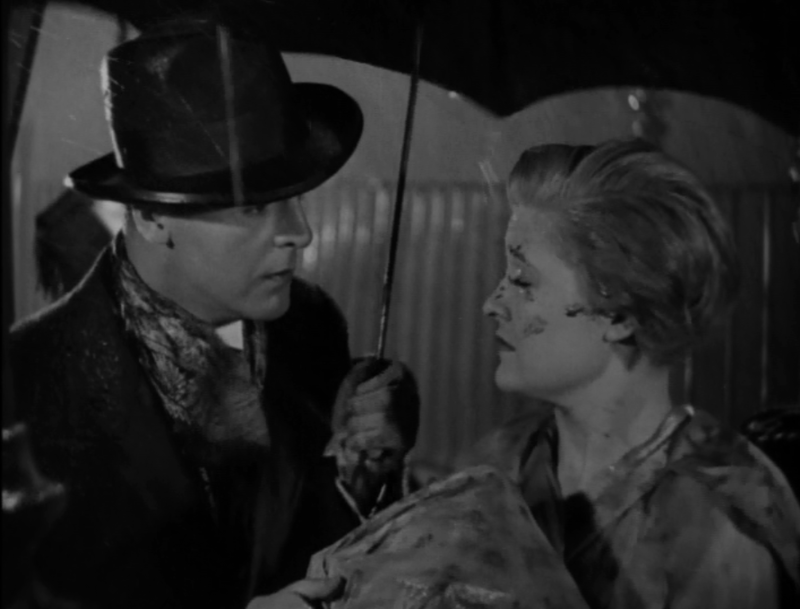 She’s stuck outside in the rain, her belongings getting ruined by the inclement weather, with no place to go… until she’s assisted by Paul Harrington (Neil Hamilton), a handsome and wealthy young stranger who takes a liking to her. Things get complicated for their blooming romance when Guy comes a-calling and threatens to reveal Evelyn’s short-lived party girl past. The great William Wyler directs 1929’s The Love Trap. This film is a hybrid silent/talkie, fully silent with intertitles for the first 45 minutes or so before transitioning to sound. I think The Love Trap would have fared better as a fully silent film, only due to the fact that the use of sound doesn’t do much to elevate it. The silent portion of the film is completely engaging, and leading lady Laura La Plante is fantastic. She’s a lot of fun to watch, not always quite as exaggerated as was typical of performances in other silents of the romantic melodrama/comedy type. She also makes the character very easy to sympathize with from the beginning, truly appearing to be a down-on-her-luck broad who really has no clue what to do. Interestingly, she seems to enunciate her words very well, making her lips easy to read during the film’s silent portion. This makes me wonder of the film was intended to be a full talkie… but I was able to find no information on the subject! La Plante and Neil Hamilton are also very fun to watch together, as a screen team. They play incredibly well off of each other and Hamilton exudes oodles of charm. They’re adorable and easy to root for as a couple. The story is just as good as the performances. It’s quickly paced and mixes its many funny moments with some true drama, particularly early on as we see Evelyn lose her job and get evicted. There are a few shifts in tone throughout the film, starting out as a “dramedy” and shifting into a comedy of misundertanding, with La Plante masterminding a way to keep Paul’s trust despite Guy’s best efforts to discredit her. Reading the opening synopsis of your review, it seemed like this film was a full-on drama, with some very serious subject matter sprinkled throughout. But no! A comedy! You sprung that on me just like a movie with an unexpected twist at the end! Interesting, too, the film’s switch from silent to sound. Hitchcock had a film, ‘Blackmail’, that did the same thing, and it was also released in 1929. Hmmmm. Blackmail is one of mt favorites from Hitch. The silence-to-sound technique worked remarkably better there than in this film!